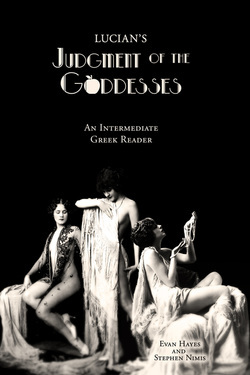 The aim of this book is to make The Judgment of the Goddesses by Lucian of Samosata (c. 120 CE –190) accessible to intermediate students of Ancient Greek. The running vocabulary and grammatical commentary are meant to provide everything necessary to read each page, so that readers can progress through the text, improving their knowledge of Greek while enjoying one of the most entertaining authors of antiquity. Lucian's The Judgment of the Goddesses is one of Lucian's shorter works and is a great text for intermediate readers. It is in dialogue form and fun to read, with few complicated sentences. The dialogue features the story of Paris' fateful decision to award first prize to Aphrodite in a beauty contest. Aphrodite had promised Paris the most beautiful woman in the world (Helen, the wife of Menelaus) as a bride if he chose her. This becomes the cause of the Trojan War, the greatest of the classical epic stories. In typical fashion, Lucian presents the characters in the story humorously, the goddesses as well as Paris. Each of the goddesses tries to pry some information about Paris out of Hermes, complains about the unfair practices of the others, and shamelessly bribes the judge. For his part Paris is interested only in the relative value of the bribes, but this does not prevent him from insisting that he inspect each of three beauties naked. There are hints of the relentless hostility that Athena and Hera, the two losers in the contest, will come to hold toward the Trojans in the epic tradition.